Our very own ~ and exclusive ~ hybrid, created using two of our awarded parents ! 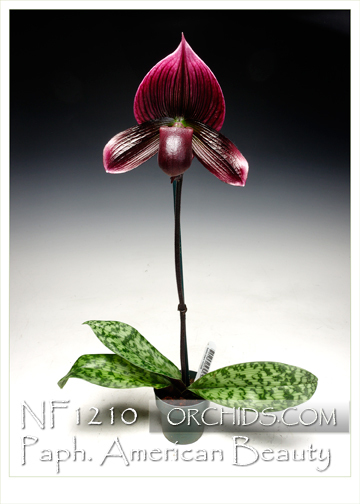 Truly an American Beauty, we registered this cross as Paph. American Beauty due to its superior vigor, thick flower spike, attractive foliage and exceptional flower quality. Capable of flowering twice a year on every new growth, it has been exhibiting large, broad and flat raspberry dorsal sepals attractively accented with wine red striping. All seedlings selected will be vinicolor based on their red pigmentation at the base of their beautifully mottled leaves. An “American beauty”, whether in flower or not, this hybrid carries really amazing potential ! Highly Recommended ! .